I was kindly sent three of the five products in the range, which I've been using over the past 5 weeks and am ready to share my thoughts on them with you today. I really love the packaging - clean, simple, pared back - matte white with copper writing makes it very aesthetically pleasing for me! The first product, and the one I was most excited to try, is Endless Summer Spray. Usually texture or salt sprays leave my hair very dry, crispy and hard and apart from the fact that I hate that feeling, I worry about the damage being done to my hair. Shelby created this product to create soft, tousled waves without any damage or crunchiness. I find it to be a mist, rather than a spray and it can be used on either damp or dry hair before running your fingers through your hair to create soft waves and add some volume. It also contains natural UV filters (beta-carotene) so it protects not just your hair, but your scalp too, against sun damage. The scent of this product is so fresh and clean so not only does my hair look good, it smells good too. There is a minimal amount of Pacific Ocean salt in this spray because the sugar it contains holds the wave meaning there is no need to use excessive amounts of salt. I will definitely be taking this on holiday with me next week and, for once, I'll be leaving my GHD at home because I love the waves I can achieve, rather than the usual "pulled through a hedge backwards" look I would otherwise have! 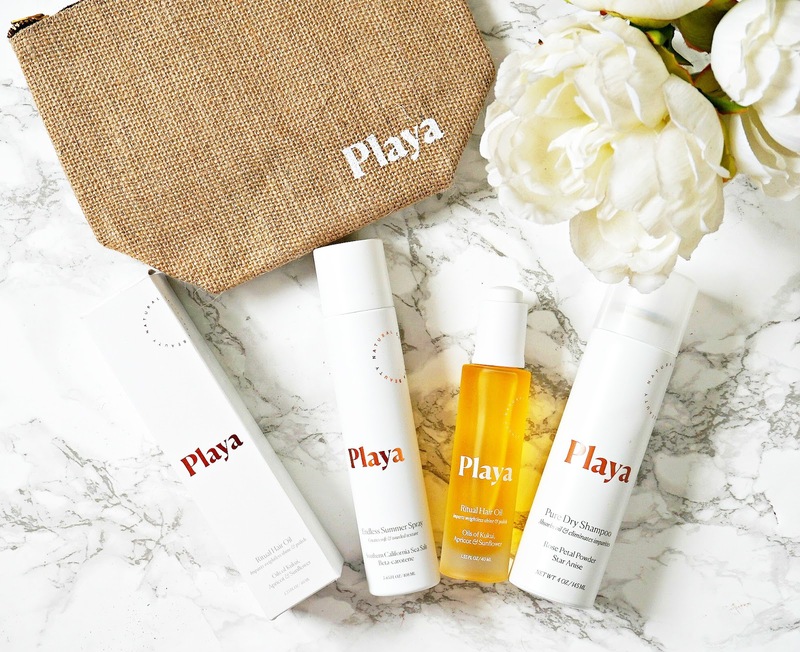 I love a good hair oil to keep my hair soft and smooth but also to protect from damage so I was very excited to try Playa Ritual Hair Oil. This oil contains a blend of kukui, apricot and sunflower oils and it actually penetrates the hair rather than just coating it. It is lightweight, has the same beautiful fresh scent as the Endless Summer Spray and it also protects the hair against UV damage thanks to the inclusion of lycopene. I like to apply to the mid-lengths and ends of my hair but I will put some into a travel-friendly bottle to bring on holiday and will be applying it before I go out into the sun to protect both my scalp and colour. It isn't as nourishing as Moroccanoil but definitely helps to tame frizz. Finally I have the Pure Dry Shampoo. In general, I am not the biggest fan of dry shampoos because I don't like the feeling of product in my hair and the white cast that some leave, however when you are chronically ill (I have Chronic Lyme Disease and M.E. ), they are a necessary product. This particular dry shampoo is definitely the best I have used, for a number of reasons - firstly; it works - it really does absorb excess oils to make the hair look less greasy and fresh, secondly; as long as you use a light hand and spray from a distance, it doesn't leave a white cast, thirdly; it doesn't leave the hair feeling like it is packed with product, fourthly; it smells lightly of roses (not old-fashioned or grannyish) and fifthly; it adds some volume and texture to the hair. Need I say any more? Oh yes, you don't actually need to use a lot of this product to achieve all of the above. This would be perfect for regular gym-goers - just make sure that you spray from a distance! Overall, I am hugely impressed by this range (but you've already gathered that I'm sure!) and feel like I need to try the shampoo and conditioner! At the moment Playa doesn't ship internationally, however I highly recommend using MyMallBox to ship products internationally that you cannot buy outside of the U.S. I have used them 6 times now and never had any problem - the service is quick and easy and they will even repackage your orders for free so that you can avail of a lower shipping fee. I really do hope that Playa will be available internationally soon because I know that the brand would be a worldwide hit. I would love to hear your thoughts on the products. Are you a fan of the Californian, beachy wave look?